1. Let us dedicate our meeting today, which falls on 19 March, to the one whom the Church, according to a very ancient tradition, surrounds on this day with the veneration due to the greatest Saints. 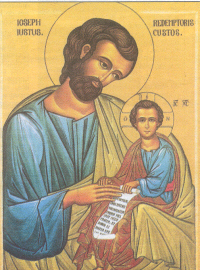 The nineteenth of March is the solemnity of St. Joseph, the husband of the Blessed Virgin, the Mother of Christ. As early as the tenth century we find this feast marked in various calendars. Pope Sixtus IV accepted it in the calendar of the Church of Rome from the year 1479. In 1621 it was inserted in the calendar of the universal Church. So interrupting the series of our meditations, which we have now been developing for some time, let us turn today to this figure so dear and close to the heart of the Church and, in the Church, to one and all of those who are trying to know the ways of salvation, and to walk along them in their earthly lies. Let today's meditation prepare us for prayer, in order that, recognizing the great works of God in the one to whom he entrusted his mysteries. We may seek in our personal lies the living reflection of these works in order to carry them out with the faithfulness, the humility and 'he nobility of heart which were characteristic of St. Joseph. 2. "Joseph, son of David, do not fear to take Mary your wife, for that which is conceived in her is of the Holy Spirit; she will bear a son and you shall call his name Jesus, for he will save his people from their sins" (Mt 1:20-21). We find these words in the first chapter of the Gospel according to Matthew. They -- especially in the second part -- sound similar to those that Miriam, that is Mary, heard at the moment of the Annunciation. In a few days -- 25 March -- we will recall in the liturgy of the Church the moment in which those words were spoken at Nazareth "to a virgin betrothed to a man whose name was Joseph, of the house of David; and the virgin's name was Mary" (Lk 1:27). The description of the Annunciation is found in the Gospel according to Luke. Subsequently Matthew notes again that, after Mary's marriage to Joseph, "before they came together she was found to be with child of the Holy Spirit" (MT 1:18). In this way, therefore, there was accomplished in Mary the mystery which had had its beginning at the moment of the Annunciation, at the moment when the Virgin replied to Gabriel's words: "Behold, I am the handmaid of the Lord; let it be to me according to your word" (Lk 1:38). As Joseph became aware of the mystery of Mary's maternity, "being a just man and unwilling to put her to shame, (he) resolved to divorce her quietly" (Mt 1:19), as Matthew's description goes on to say. And precisely then Joseph, Mary's Betrothed and before the law already her husband, receives his personal "Annunciation." During the night he hears the words we quoted above, the words, which are an explanation and at the same time an invitation on the part of God: "Do not fear to take Mary your wife" (Mt 1:20). 3. At the same time God entrusts to Joseph the mystery, the fulfillment of which had been awaited for so many generations by the race of David and the whole "house of Israel," and at the same time He entrusts to him everything on which the fulfillment of this mystery depends in the history of the People of God. From the moment when these words reached his consciousness, Joseph becomes the man of Divine election: the man entrusted with a special responsibility. His place in the history of salvation is defined. Joseph takes this place with the simplicity and humility which reveal the man's spiritual depth; and he fills it completely with his life. "When Joseph woke from sleep -- we read in Matthew -- he did as the angel of the Lord commanded him" (MT 1:24). In these few words there is everything. The whole description of Joseph's life and the full characteristic of his holiness: "He did. Joseph, the one we know from the Gospel, is a man of action. He is a man of work. The Gospel has not preserved any word of his. It has described, on the contrary, his actions: simple, everyday actions, which have at the same time a limpid meaning for the fulfillment of the divine Promise in the history of man; works full of spiritual depth and mature simplicity. 4. Such is Joseph's activity, such are his deeds, before there had been revealed to him the mystery of the Incarnation of the Son of God, which the Holy Spirit had effected in his Betrothed. Such also is Joseph's subsequent work, when -- already aware of the mystery of Mary's virginal maternity -- he remains at her side in the period preceding the birth of Jesus and above all on the occasion of the Nativity. Then we see Joseph at the moment of the presentation in the temple and of the arrival of the Three Wise Men from the East. Shortly afterwards the drama of the newborn babies in Bethlehem commences. Joseph is again called and instructed by the voice from Above on what to do. He undertakes the flight into Egypt with the Mother and the Child. Shortly afterwards, he returns to his native Nazareth. There he finds again at last his house and the workshop, to which he would certainly have returned before if Herod's atrocities had not prevented him. When Jesus is twelve years old, he goes with Him and Mary to Jerusalem. In the temple of Jerusalem, after they have both found Jesus whom they had lost, Joseph hears these mysterious words: "Did you not know that I must be in my Father's house?" (Lk 2:49). Thus spoke the 12-year-old boy, and Joseph, like Mary, knows very well about Whom he is talking. Nevertheless, in the house at Nazareth, Jesus was obedient (Lk 2:51) to them both, to Joseph and Mary, just as a son is obedient to his parents. The years of the hidden life of the Holy Family of Nazareth pass. The Son of God -- sent by the Father -- is hidden from the world, hidden from all men, even from those nearest. Only Mary and Joseph know his Mystery. They live in his circle. They live this Mystery daily. The Son of the eternal Father passes, before men, as their son; as "the carpenter's son" (MT 13:55). When the time of his public mission begins, Jesus will refer in the synagogue of Nazareth to Isaiah's words, which are fulfilled in him at that moment, and neighbors and his fellow townsmen will say: "Is this not Joseph's Son?" (Lk 4:16-22). The Son of God, the Word Incarnate, remained hidden for thirty years of his earthly life: hidden in the shadow of Joseph. At the same time Mary and Joseph remained hidden in Christ, in his mystery and his mission. In particular Joseph, who--as can be gathered from the Gospel -- left the world before Jesus revealed Himself to Israel as the Christ, remained hidden in the mystery of Him whom the heavenly Father had entrusted to him when He was still in the Virgin's womb, saying to him through the angel: "Do not fear to take Mary your wife" (MT 1:20). Deep souls -- such as St. Thérèse of Jesus -- and the penetrating eyes of contemplation were required in order that the splendid features of Joseph of Nazareth -- he whom the heavenly Father willed to make, on earth, his trusted one -- could be revealed. The Church however has always been aware, and is particularly aware today, of how fundamental was the vocation of that man: the husband of Mary, the one who, in the eyes of men, passed for the father of Jesus and who was, according to the spirit, a perfect incarnation of fatherhood in the human and at the same time holy family. In this light, the thoughts and the heart of the Church, her prayer and her devotion, turn to Joseph of Nazareth. In this light the apostolate and pastor work find in him support in that vast and at the same time fundamental field, the vocation of marriage and parenthood, the whole of family life, full of the simple and helpful solicitude of the husband for his wife, of the father and mother for their children -- life in the family -- in that smaller Church on which every Church is constructed. Since we are preparing in the current year for the Synod of Bishops, the subject of which is "the role of the Christian family," we feel all the more the need of the intercession of St. Joseph and his help in our work. The Church which, as the society of the People of God, calls herself also the Family of God, also sees St. Joseph's very special place with regard to this great Family and recognizes him as her special Patron. May this meditation awaken in us the need of prayer for the intercession of him in whom the heavenly Father expressed, on earth, all the spiritual dignity of fatherhood. May meditation on his life and works, so deeply hidden in the mystery of Christ and, at the same time, so simple and limpid, help everyone to find again the rightful value and beauty of the vocation from which every human family draws its spiritual power and holiness. With these sentiments let us now address our prayer to God. Beloved Brothers! God has deigned to choose man and woman to collaborate, in love and in toil, in his work of creating and redeeming the world. Let us raise together our prayer to God, through the intercession of St. Joseph, the head of the Holy Family of Nazareth and Patron Saint of the universal Church. Let us pray together and say: Lord hear us! 1. For all pastors and ministers of the Church, that they may serve the People of God with active and generous dedication, as St. Joseph served in a worthy way the Lord Jesus and his Virgin Mother, Lord hear us! 2. For the public authorities, that in the service of the common good they may direct economic and social life with justice and uprightness, in respect for the rights and dignity of all, Lord hear us! 3. That God may deign to unite with the Passion of his Son the toil and suffering of the workers, the anguish of the unemployed, the grief of the oppressed, and that He may give help and comfort to everyone, Lord hear us! 4. For all our families and for all their members: parents, children, the old, relatives, that, in respect for the life and personality of each one, they may all collaborate in the growth of faith and charity, to be real witnesses to the Gospel, Lord hear us! Oh Lord, bestow on your faithful the Spirit of truth and peace, that they may know you with all their soul, and generously carrying out what pleases you, may always enjoy your benefits.